It happens to the best of us – the accumulation of little bits of glass. Too big to throw out but not great enough to make it into an official art piece. Soon, plastic bins are bulging with these discards. How to alleviate the guilt? 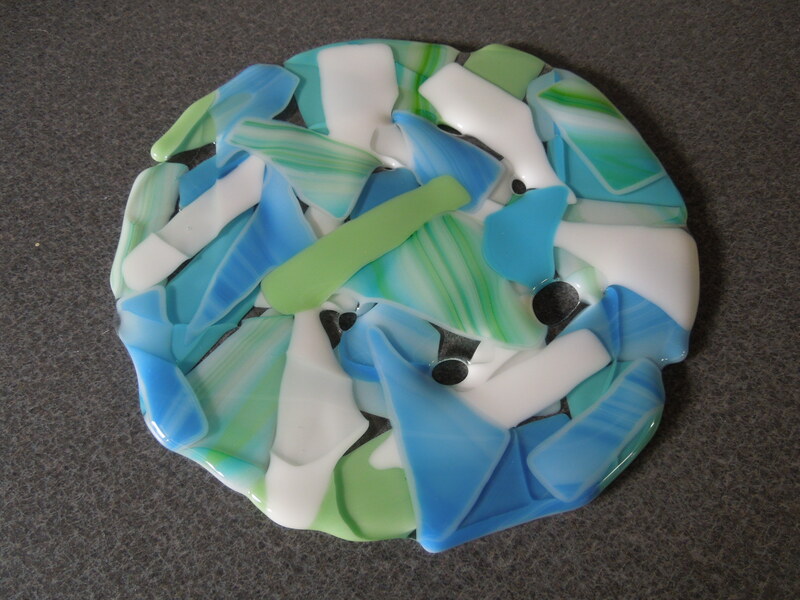 Make more fused glass! 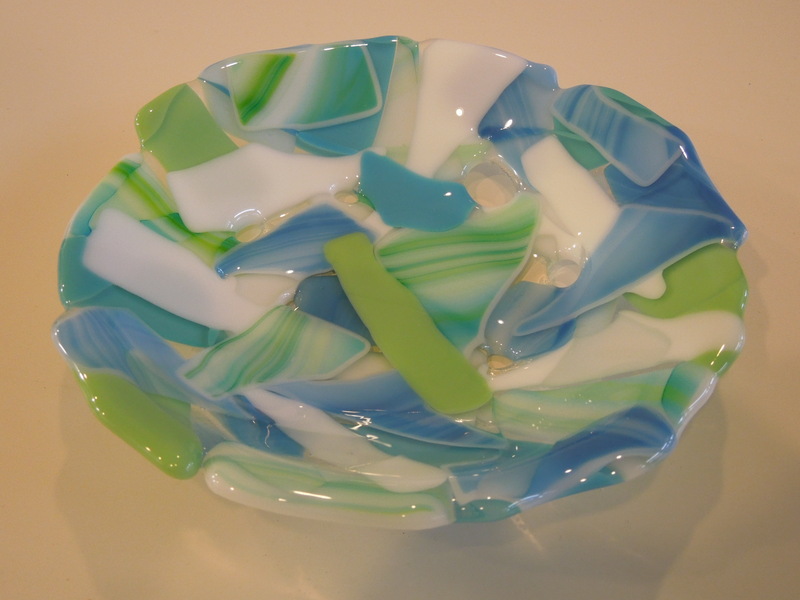 These scattered glass pieces are some of my favorites and are almost ‘free’ since they are composed entirely of scrap glass. Assemble some scraps. Be sure to include a lot of clear glass. 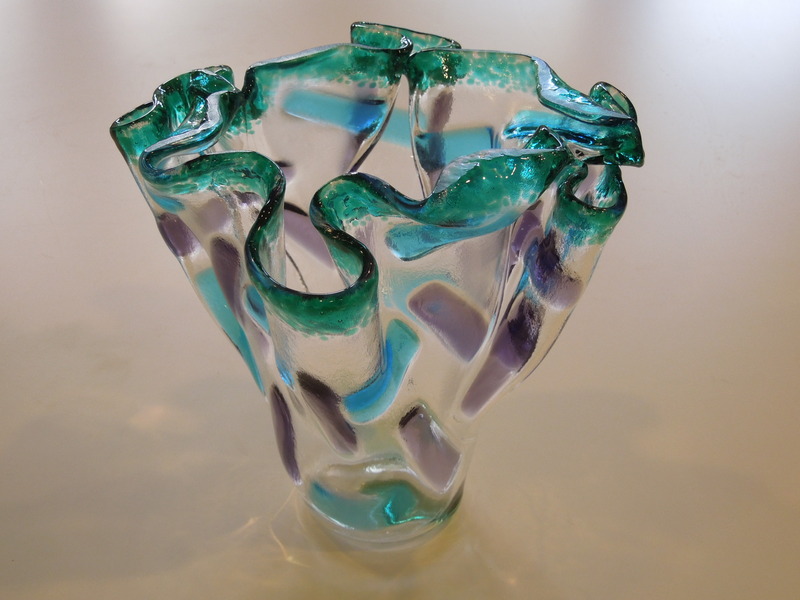 This example uses opaque glass but it is even better layering transparents. Freely snip pieces into irregular shapes. Don’t cut a glass base. We are going to be creating a piece with holes. Do have an outline drawn on kiln paper or a general shape in mind as you begin to lay out pieces. Start on the outside and work towards the center. Leave lot of space. 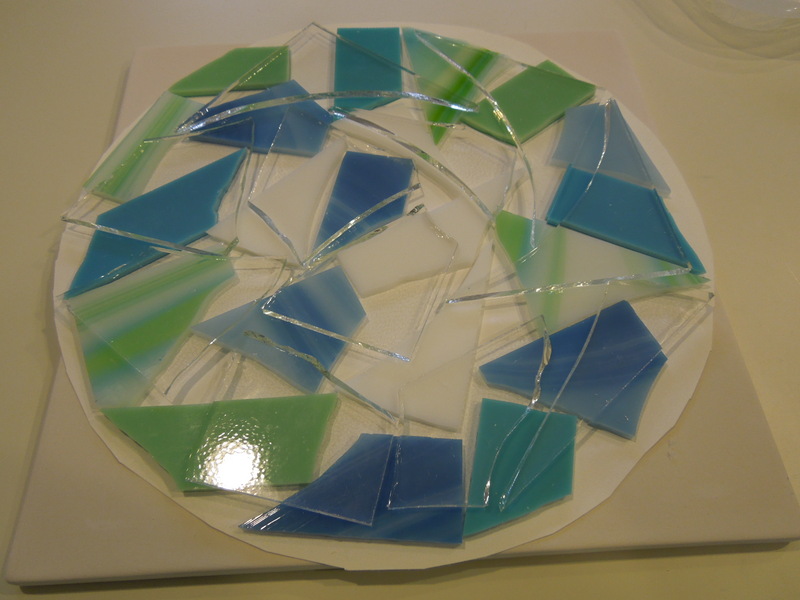 Then add another layer of glass pieces – creating bridges between other pieces. Continuing stacking and layering. Remember to use lots of clear! In general, it is ideal to have 3 layers of glass in the overall stack. A few places could have up to 4 pieces but don’t overdo it. Here’s the final raw piece and what it looks like after a full fuse. Now slump into a mold. This one is a 8″ bowl. You can also try plates and platters, etc. 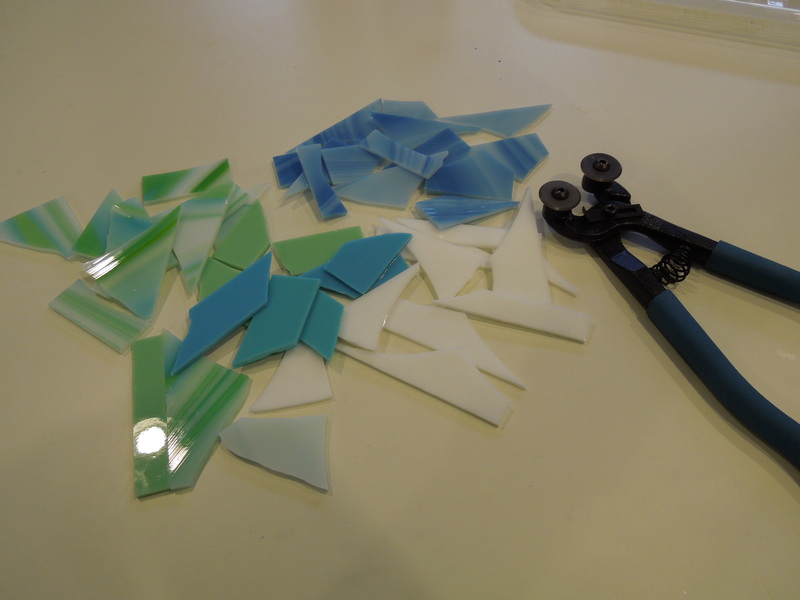 Now there is no excuse to throw out glass scraps bigger than 1/2-1″! The best use of leftovers ever. 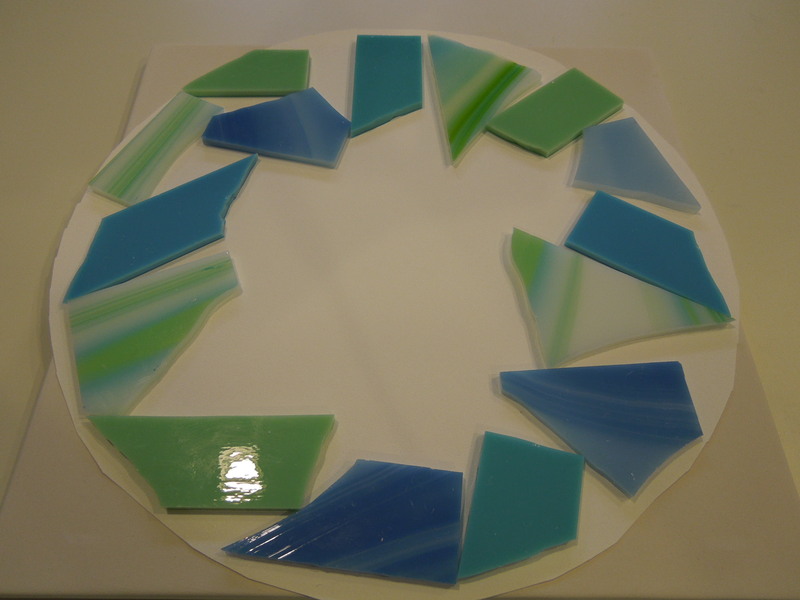 One of my first exposures to fusing glass involved a very simple class where we selected 1 sheet of glass, cleaned it, figured out the center, and placed it over a form in the kiln. 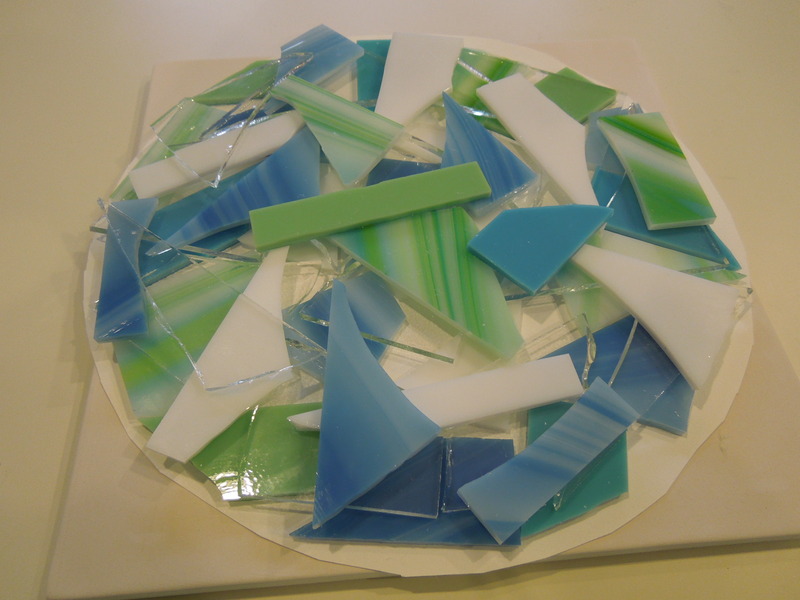 The instructor worked some kiln magic and after several hours invited us to peer into the kiln to see how the flat sheet of glass had begun to fall around the form. (This is technically draping and not slumping glass). How cool! 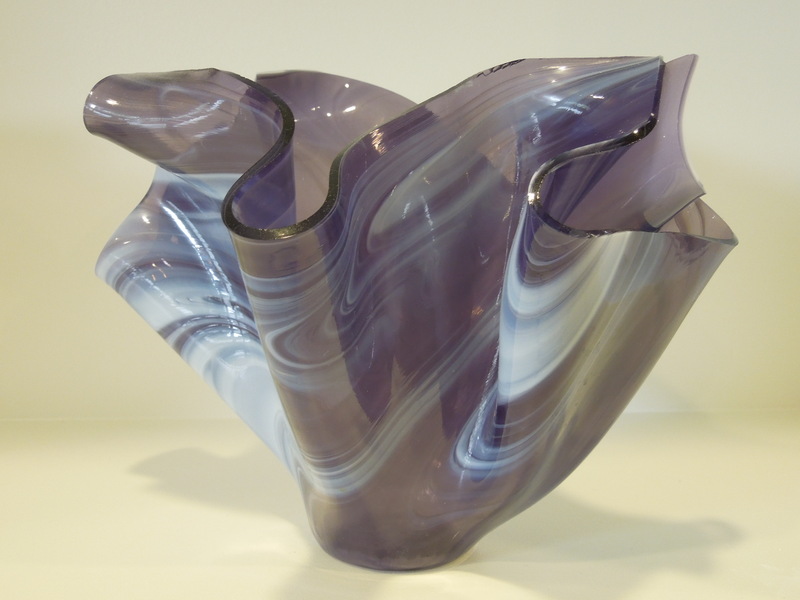 Was it really that easy to make beautiful glass vases? I didn’t know enough to realize what factors played a role in creating the magical whimsical handkerchief forms. Nevertheless, like a junkie’s first hit, I was hooked. Yes, the instructor muttered under her breath about the danger of over-firing the glass and actually getting the mold stuck within the glass and having to destroy the glass and even the mold but who was listening? This post will not auger into disaster scenarios, though. (There is plenty of time for examples later…). With time, I have begun to see the versatility possible with creating vases. Obviously one can fuse many pieces together to create a 2D sheet that is far more complex and exciting than a single color sheet of glass like I was first exposed to. Another Boulder artist, Bobbi Vischi (www. bobbivischi .com), takes this to an awesome level. The key to the final shape all comes down to temperature. I have conducted a experiment creating vases that have been taken to different slump temperatures. Remember, glass most soften and begin to melt. The amount the glass ‘melts’ is temperature dependent. The glass will first seem to fold along one axis creating what is affectionately known as a ‘taco’ (or is it because this always seems to occur at lunch time during classes?). 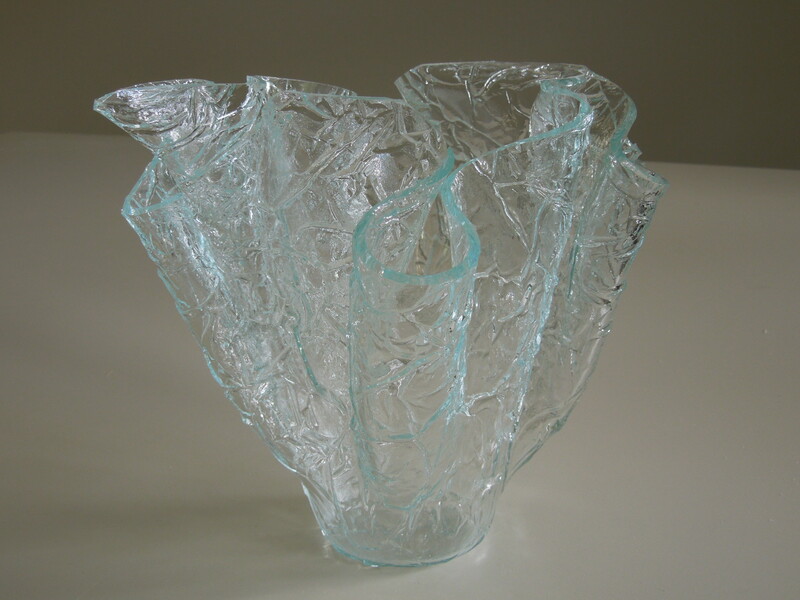 As the temperature is increased, the glass moves more and additional folds are created. At higher temps, the glass really begins to take on the form of mold it is draping over. Go much further and you are risking it all. ‘Don’t forget time!’ you may say but that seems almost secondary to the ultimate heat the glass is exposed to. At low temperatures, even if I hold for an extended period of time, I can’t seem to move much beyond the taco shape. 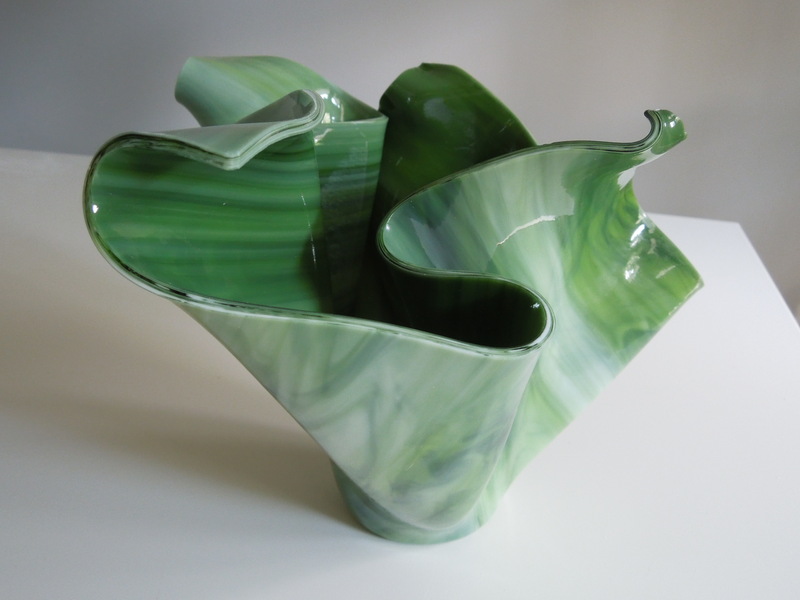 Now back to experimenting with my vases….